Almost every single day, for the most of us, the morning journey in our car to work is the time which decides our mood for the rest of the day. We travel on an average for more than an hour through pollution, dust and heavy traffic, which makes us tired and agitated. It can be even more frustrating if the interior of our car is dull, unclean or messy. Over a period of time, plastic and wooden interiors of cars tend to loosen up, dust and grime tend to accumulate in various corners inside the car and mirrors look foggy. Even though we do carry a piece of cloth for a quick wiping of car interiors, it does not give fresh and clean look for a long time. But now, with 3M Car Care’s Interior Premium Treatment, you can be rest assured that your car’s interiors will be spotlessly clean and its furniture intact. 3M™ Interior Premium Treatment ensures that your car’s interiors are spotless clean. 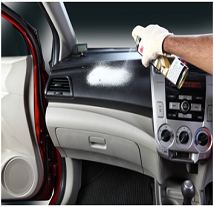 3M™ Foam-It cleaner solution is applied to seats, windows & dashboards to remove dust and grime. Then, 3M™ Spray Dresser is applied on plastic and rubber parts to improve the overall aesthetics and life of your car parts. All glasses and mirrors are cleaned 3M™ Glass Cleaner to give it a squeaky shine. 3M™ Foam-It applied on interiors.